Are Careers in Manufacturing Just “Dirty Jobs’? A recent article, Are Parents Out of Touch with Careers in Manufacturing? 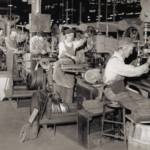 by Joel Don, discussed the poor perception taken by some regarding manufacturing careers. These people may believe these careers are monotonous, dirty, dangerous, and a dead-end. This view may be held by some, but many people working in this field know better. They know that technicians, engineers, and business professionals are typically highly skilled, highly paid, and in great demand. They know that industrial technology, presently in use, requires high-tech skills. Further, they know that the foundation for these high-tech skills is available NOW! With one of the Industrial Society of Automation’s (ISA’s) chosen goals being to foster careers in industrial automation & control, our next two monthly section meetings will attempt to put this misperception to bed. On September 20th, the ISA Will-DuPage Section will be touring the Electromechanical Technology, HVAC, and Manufacturing lab areas at College of DuPage in Glen Ellyn, IL. COD has a long history of providing well qualified electrical and mechanical technicians to local manufacturers. These hands-on lab areas offer these students a strong background in these technical areas. You are more than welcome to attend. Visit http://isawilldupage.org/event/september-2016-technical-meeting/ for more information. On October 11th, we welcome United States Representative Bill Foster, 11th Illinois District, to discuss Science Technology Engineering & Mathematics (STEM) education initiatives. Rep. Foster, the only physicist in Congress and a businessman, knows the importance of fostering STEM education.